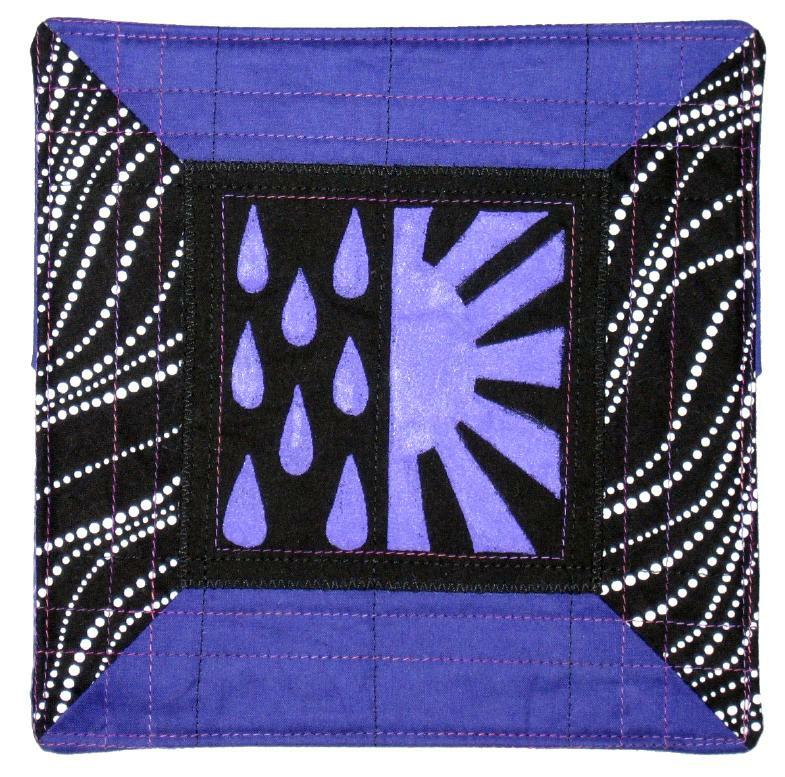 This is one of the little Priority: Alzheimer’s quilts, Rain or Shine, that I donated to Ami Simms’ project, the Alzheimer’s Art Quilt Initiative. It’s time to celebrate! I made a commitment to donate enough Priority: Alzheimer’s quilts to bring in $1000 of revenue for the non-profit. Thanks to those who purchased my quilts, I’ve exceeded my $1000 goal! Thank you to all those who donated $ to receive a quilt, some of you I know, and some I don’t. You can see my page of donated quilts here. You too can donate or purchase quilts, see the traveling exhibit Alzheimer’s: Forgetting Piece by Piece (I also have a quilt in the show), buy the book, or get involved in other ways! What an amazing way to raise $ for Alzheimer’s disease research. Ami and all of her volunteers rock my world. Lines IV is off to the Copper Shade Tree Gallery tomorrow for the “It’s not a quilt…or is it?” show, along with several of my other pieces. 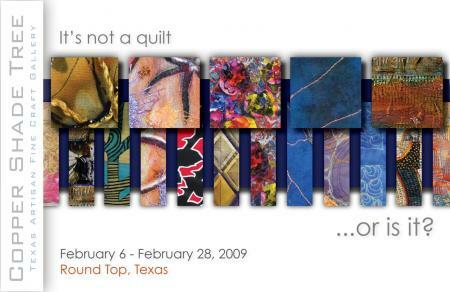 The show and sale is February 6- February 29, 2009 in RoundTop, Texas, with 18 textile artists represented. Come and join us for the reception on February 6th, from 6pm-9pm. Food, wine, and art. How can you miss? Come on out and buy something lovely to take home with you! It’s Halloween, one of my favorite times of the year! This is a photo of our Halloween tree, in all it’s fabulousness. It makes me giggle. I mean come on, there are stretchy skeletons hanging from ribbon nooses. What’s not to love? If you’re going to be visiting the Houston International Quilt Festival, don’t miss my quilts! One Tree Quilt and Dragon are in the judged show Quilts: A World of Beauty. Also, Little Red Spot is in the Special Exhibit, The Sky’s the Limit. The Alzheimer’s Art Quilt Initiative will be having a booth where you can purchase Priority: Alzheimer’s Quilts, a handful of which are mine this year. All proceeds go to Alzheimer’s research. Stop in and say hello to Ami and Debbie and take home a quilt! Ami is taking 1000 donated quilts, so there’s surely one to please you. Please check out Ami’s blogpost here for all the details. 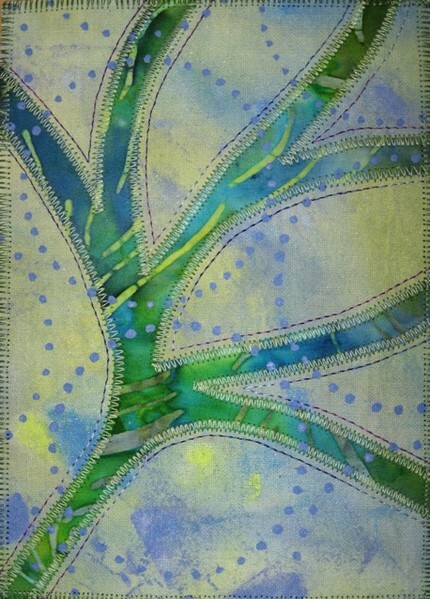 I am also bringing ACEO’s to trade at the Quilting Arts booth. The theme this year was holidays, so of course skulls came to visit my work! I had a lot of fun working with both paint and paintstiks in these pieces. You can see some of them in the photo below. 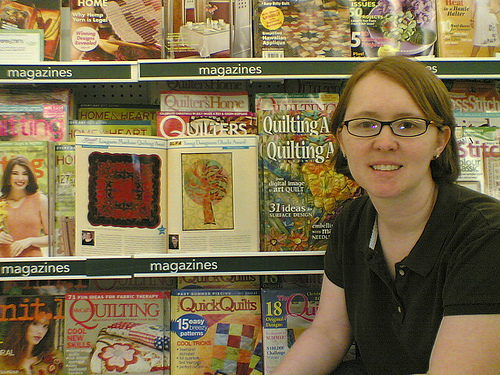 One Tree Quilt, winner of the Olfa Okada Young Designer’s Award at AQS Paducah this year, is looking smashing in the November 2008 issue of Quilter’s Newsletter magazine! 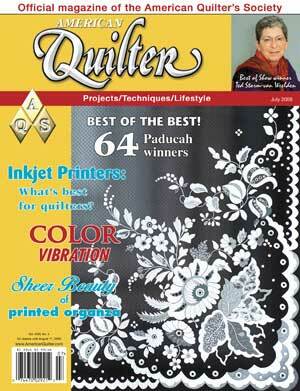 Thank you to my fellow art quilters who kindly alerted me that my piece was included in this issue. The Olfa publicist let me know they requested permission for photo use back in April, but I thought they had decided not to print it. 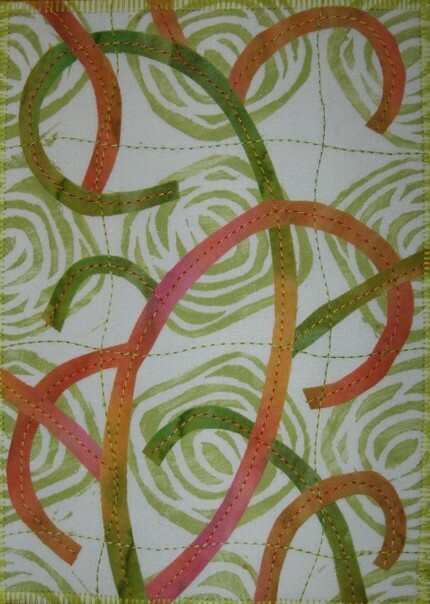 Thank you, Quilter’s Newsletter magazine for including my piece! I’m delighted to say that One Tree Quilt has won an award at the AQS Paducah, KY Quilt Show this year! It received the Olfa Young Designers Okada Award. I am completely excited and honored. This piece is an extension of a 2007 weekly journal quilt that was so intriguing that I decided to make it on a larger scale. Go weekly art! My husband really encouraged me to make this piece on a larger scale and so he is super excited about tHIS award. And yes, I can’t wait to spend the $5000 on art quilting supplies. Here’s looking forward to stimulating the art quilting economy. If you are lucky enough to be at the show right now, please stop by and smile! All of the AQS award winners can be seen here. By the way, I would like to point out that 3 of the Alzheimer’s Forgetting Piece by Piece artists won awards in this show. Congrats to Diane Gaudynski and Becky Goldsmith. 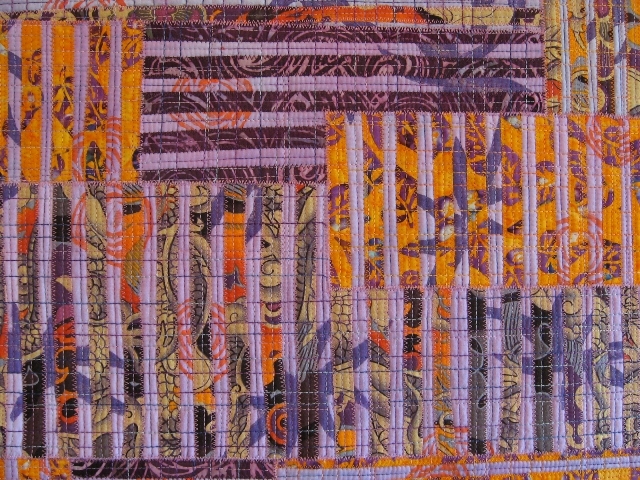 Karen Musgrave, a fellow artist from the Alzheimer’s: Forgetting Piece by Piece exhibit, has been kind enough to interview me for the Alliance for American Quilts Quilter’s S.O.S. – Save Our Stories archives. She is a volunteer for this amazing project that helps document our quilting heritage. As I went through this interview process, I realized how interesting it will be for me to look back in a few years on this snapshot of my ideas and process at this point in my progression as a textile artist. Pretty cool if you ask me. Thanks, Karen, you are amazing! You can read the interview and see a photo of my quilt, Lost Moments, here.